Prevention is often said to be more powerful than a cure. With an eye toward thwarting the disease, some researchers are trying to understand the molecular processes that are present in cells before cancer develops. These efforts, which focus on premalignancy, are featured in the spring issue of Cancer Today, a magazine for patients, caregivers, and survivors that is published by the American Association for Cancer Research (AACR). The idea that abnormal but otherwise benign tissue may hold clues for how cancer gets its start is not new. In 1953 otolaryngologist Danely Slaughter, MD, observed microscopic abnormalities in tissues adjacent to oral squamous cell carcinoma tumors. Noting that this type of oral cancer often recurs or gives rise to new types of cancer even after surgery, Slaughter proposed that normal-appearing tissue adjacent to tumors could harbor some invisible features of cancer. Slaughter’s idea, coined “field cancerization,” remains an interesting one for scientists, who continue to test and apply the concept to other types of cancer, including colorectal, prostate, lung, stomach, breast, and bladder cancers. Tissue samples from areas surrounding tumors may, in fact, hold some clues for how cancer develops in the first place. One existing technology, currently in clinical trials, is able to use samples of healthy tissue in the upper airways to distinguish between malignant and nonmalignant lesions deep in the lungs, where biopsies can be challenging and deliver inconclusive results. When used with a bronchoscopy, a minimally invasive method for assessing lung nodules, the Percepta Bronchial Genome Classifier was able to correctly classify lesions as cancerous 97 percent of the time compared with bronchoscopy alone, which accurately classified tumors 75 percent of the time. “Now, this is a diagnostic test, but the long-term goal would be to take a swab of the nose or mouth and determine if the person is going to develop cancer five years from now,” said pulmonologist Avrum Spira, MD, MSC, director of the Boston University-Boston Medical Center Cancer Center, who helped develop this technology. There are challenges to analyzing tissue that has yet to have characteristics of cancer. Many benign lesions, including those found with screening methods such as mammograms, colonoscopies and computed tomography (CT) scans, do not go on to become malignant, for example. 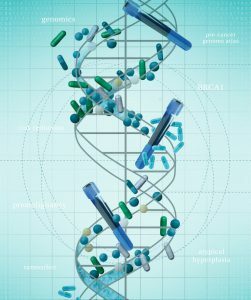 “The real key is determining the genetic, epigenetic, or molecular signatures that distinguish those lesions that have the potential to progress from those that are likely to remain benign indefinitely, and that is an extremely important question,” noted cancer biologist Emily Greenspan, PhD, program director of the NCI’s Provocative Questions Initiative. To help decode cancer before it starts, some researchers suggest the need for an initiative as large as The Cancer Genome Atlas (TCGA), which provided a map of key genomic changes in 33 types of cancer. Efforts to study premalignancy, however, would call for far more coordination than the TCGA needed, since it would require not only analyzing tissue samples, but also understanding outside factors such as immune system function. Researchers would also need to follow up with patients to determine which molecular abnormalities advance to cancer, said Szabo. Just because you find an abnormality doesn’t mean it causes cancer down the road, she pointed out. The spring issue of Cancer Today also featured an article on common sense habits that can help to reduce cancer risk now.